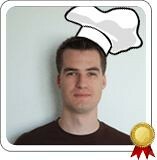 Here’s our CodeChef Programmer of the month for February 2010. He came in the top 20 for the July Challenge, and has been prominent on CodeChef ever since. He’s even submitted the tuorial Coin Game to our wiki. Lets find out more about our Programmer of the Month for February, Mark Greve. going on by looking at the blog or checking the tweets. That varies quite a lot. On average I’d say around 3 hours per day. reading the trilogy in five parts about the Hitchiker’s Guide to the Galaxy. intelligent comedic dialogue in these books. That’s too hard to answer. Once I’m done with my PhD studies, I will probably go for an industry job. when I started back in 2007, so I probably won’t leave competing anytime soon. congrats! A deserving programming indeed. I remember he solved September's Alien Language problem in no time, not to mention this months' Place the balloon. Could you give me some suggestion regarding programming? Where to start from,specially the algos. Congratulations sir….a deserving programmer indeed..sir, i am from India, i am looking for intern in some IT company, can you please help me out…. Congratulations sir….a deserving programmer indeed..
sir, i am from India, i am looking for intern in some IT company, can you please help me out…. i too want to have the competition . congrats sir…but cn u tl me how to start with programming in c++ related to ports(rs-1/rs-2) in pc.m actually a beginner n i want to start programming in such areas. i wud b obliged if u gv me some idea abt it. hello sir..congrats…:-)i m very much fond of programming…bt problem with me is that till nw i hv used “Turbo C” bt here we hv to make coding in GCC compiler..can you tell how can i cope up with that..??? bt problem with me is that till nw i hv used “Turbo C” bt here we hv to make coding in GCC compiler..
can you tell how can i cope up with that..??? Congratulations, yar…….Do ur best….Best luck for next…..
Nicely done Mark I would have commented earlier but was on holiday. You well deserve to win february! Good luck on your studies! well done……send me links and tips on perfecting C language and pointers and if possible cll and stacks using pointers…I m a beginner ..how do I perfect C?